If you're looking for a reason to focus on customer personas for your business, I recommend that you read Everything that's wrong with retail summed up in one question. The article makes a strong case for personas as a means for connecting with profitable customers. The article describes a conflict between focusing on a business' most profitable customers [i.e., those who pay full price] and bargain hunters [i.e., who wait for sales]. Despite a rational response that a business is better off focusing on profitable customers [i.e., an important persona], many focus on bargain hunters [i.e., a minor persona]. 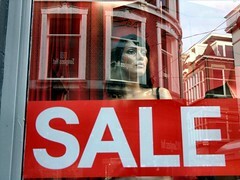 As the article states: "... everything that's wrong in retail today. We're willing to ignore the needs and interests of our most profitable customers to cater to people who don't really value what we have to offer and won't buy unless we offer them a discount...."
This retailer hasn't made an effort to understand customers, especially loyal ones. This retailer can't be trusted to be consistent in its product pricing. This retailer believes customers are fools and can be taken advantage of. Customer says: "I will not be taken advantage of, oh untrustworthy retailer!" and proceeds to bargain hunt all s/he can. After all, when businesses aren't trusted, price becomes the primary decision factor. Imagine if that bargain hunter focused retailer had fully understood and embraced that a specific customer persona [i.e, non-bargain hunters] represents the business' primary source of revenue and profitability: the constant sales events and promotions would be banished. The bargain hunter would be discouraged and the profitable customer made to feel appreciated! Here's an example of one retail business that does: Nordstrom's, aka The Retailers' Retailer. I'm willing to bet that Nordstrom has developed detailed customer personas. Personas require that a business accept that it cannot be all things to all customers. Personas require that a business focus consistently on who's important without being distracted by minor players. Personas demand that a business commit resources to fully understanding customers relevant pain points and needs. Personas force businesses to stay focused. Personas enable businesses to connect with customers. Although my example comes from retail, this situation plays itself out across many industries on a regular basis - B2B as well as B2C. Why not embrace personas for your business? You might be surprised by the relationships you develop with customers.